Surrounded every day with noise everywhere we go, our hearing has become increasingly adept. Somehow amidst the din we are able to pick out the sound of our mobile phone ringing. We can hear a siren approaching through a fog of traffic. Through noise-cancelling headphones and music, we miraculously detect the flight attendant offering us a bag of pretzels. But in our attempt to drown out the unwanted noises, we have become deaf to the music of our environment, according to artist Bill Fontana, who has spent the large part of three decades crafting sound sculptures in public spaces, museums, and galleries around the world. "People in our culture learn not to listen," Fontana observes. "They are walking around with headphones stuck in their ears, in a bubble of music. They don't relate to or experience the sounds that are around them, and I am trying to create projects to open people's ears and minds to the present moment that they're living and to the sounds they're experiencing." The citizens of Chicago are some of the latest to encounter Fontana's sound sculpting technique. There, the Jay Pritzker Pavilion in Millennium Park has been transformed by his carefully composed kinetic audio installation. Almost a year ago, while Fontana was teaching as Distinguished Visiting Professor at the School of the Art Institute of Chicago, he was commissioned by Millennium Park Inc. to produce a piece of public sound art. 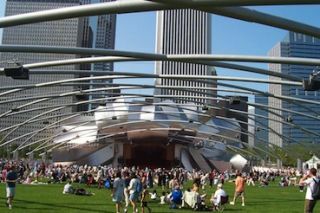 Fontana was intrigued by the Frank-Gehry-designed Pritzker Pavilion and the gigantic trellis that was created to support a distributed audio system which creates an immersive audio experience across the lawn. "What the Pritzker Pavilion lacked though was the ability for me to address the individual loudspeakers in the trellis," Fontana explained. "To be able to do that I turned to my friends at Meyer Sound to bring a D-Mitri system to Millennium Park so that I could compose and create this kinetic sound piece, where different layers of sounds are moving and floating above the park from the trellis." Fontana's relationship with Meyer has thrived for many years, and in fact, he was the artist who originally inspired the creation of the tiny MM-4 speaker for a public transit piece he did in France. Thus, he is well-versed in Meyer's various technologies. Meyer Sound's generous contribution to the project was installed in collaboration with Jonathan Laney, the original designer of the Pritzker Pavilion system with the team at Talaske, where he was working when the project was commissioned nearly ten years ago. Laney is now a principal at Threshold Acoustics, and maintains his role as systems tech at the park in the summer months. "The D-Mitri system allowed us to move beyond to the current system limitation of 5.1 for a sound art application, enabling 64 channels of individually addressable audio throughout the trellis," Laney explained. "With Bill's reputation and Meyer's generous donation, we were able to insert that technology into the existing architecture and create what is a much larger canvas of opportunity for sound artists to create for the system." Once he had access to the D-Mitri, Fontana was off and running. "Sitting in the middle of the Pritzker Pavilion under the trellis, with a space map in D-Mitri, you could draw a trajectory, and then hear a trajectory, and if you liked it, you could save it. Then you could build up layers of trajectories, which was very interesting to be able to do. It's kind of an expensive tool to use, but it's certainly a great one. I think I got spoiled a little bit, using it." Fontana built the piece from a collection of sounds he recorded in surround. "As much as possible I tried to work with sounds I could find and record in Chicago. I wanted the sound piece to be my response to being in Chicago, because I felt like Millennium Park bears such a strong relationship to the city around it." The resulting piece, Soaring Echoes, was unveiled in May 2012 for the School of the Art Institute of Chicago's commencement ceremonies, and has since played for an art fair and the International Sculpture Conference in Chicago last summer. But most importantly, the piece has played an ongoing role in the sonic landscape of the park throughout the summer and fall months, and is expected to launch again this spring. Part of Fontana's aim with the piece was to make it transparent to the environment around it, and yet draw listeners in with its kinetic attributes. "The way the sound sculpture works, it doesn't isolate you from the sounds of Chicago. If you hear a siren or an airplane going overhead or you hear people's voices, they become a part of it, morphing into some of what you're hearing in Millennium Park. So maybe you leave the park with some new ears for the sounds of the city." Using advanced audio technology for a public work of sound art is a salute to the many layers of audience understanding and reaction connected with any AV installation. Some people get it and talk about frequency range, and some just enjoy themselves.